Your Kingodom is calling! We Rule from ngmoco is a massive multiplayer world building type iPhone game featuring a ton of items and add-ons that will literally keep you busy for as long as you want to be kept busy. Amongst its first round of Freemium apps, We Rule features a self contained kingdoms world where you and your friends connect, build, farm and try to rule. If you thought farming apps were addictive and complex, wait till you see We Rule. The iPhone game involves you as the ruler of your land. 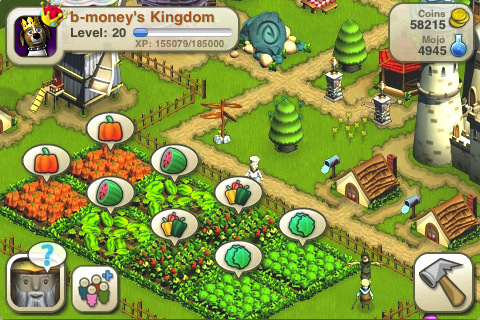 You start out farming to grow and harvest crops like any other farming game. But then you will have the ability to use your farming profits to buy and trade in order to build castles and eventually spawn your very own kingdom. Like SimCity, you architect the area, and here you have control over your every move, including the land, farms, castles, houses, stables, town shops and more. Your land contains residents, whom you rule. They work for you to harvest crops and build additional housing and buildings. They even pay you taxes for added realism. Using the Plus+ network, We Rule allows you to connect with friends and either get inspired by them or have them join you to expand your kingdom, and so on. The graphics, icons, background music, and audio effects in We Rule are of the highest quality. We literally feel like we’re living in the Renaissance era when playing We Rule. The network is powerful and expectedly quite busy due to the game’s extremely high adoption rate early on. The game is free but with ads. There are also lots of in app purchases to go around in the WeRule Store. You can buy a Bottles, Carafes, Cases, Flasks, and Vials of Mojo for anywhere form $0.99 to $49.99 to help increase your Mojo points. AppSafari review of We Rule was written by Joe Seifi on March 21st, 2010 and categorized under App Store, Featured, Free, Fun, Games, Multiplayer, Resource Management. Page viewed 34960 times, 8 so far today. Need help on using these apps? Please read the Help Page. add me “elmo221893” my shops are all opened! Just starting out and liking it a lot!!! Hi! Add us and visit! this is the best game that i have ever played on my ipod touch. u should totally get it ! Add “Tribal” – Its good for your circulatory system! add me. I have 20 Open shops! We are level 18, big rewards for shopping at our kingdoms!! Just started please add me. + ID is lostone. Several shops open and will be adding more soon! I have shops generally open most of the time… add me and I’ll add you back – I check my friend “followers” frequently! Hi, please add me and my wife. Add me: MSbeeman. I’m almost lvl 10. Ill buy things from u, if u buy frm me. Please add me: my shops are always open and I need more people to visit. I have alot of open shops. Please stop by and add me. I have alot of open shops! So add me jgordon84 and I’ll do the same. Add me jgordon84 and I’ll do the same. My Dragon Lairs and Griffin Nests are usually available. Come over and check out my lands. Jnemeth add me- lots of griffin eggs!! hey add me people ! just started out but im addicted to im on most of the time!! And plan to add more as I can. added everyone here, please add me back! Add me : “brunoinny” level 24 ! does anyone have like a real town on this game? Still learning! Please feel free to add me!! my kingdom is wicked pretty – check out my lovely shops! I’m totally open for business! Lots of businesses. Prompt delivery. I’ve got three red dragon lairs and a ton of other high quality shops. I also shop from whoever buys from me. Come check out my kingdom! Lots of open shops and will return the favor, add hemo66. Active player looking for friends and business. Lots of shops open. Add me: tystick08. Thanks. add me! I play We Rule, We Farm, and We City. as long as you accept my orders I’ll accept yours! Please add me I play daily and have plenty of shops!